NARRAGANSETT, R.I. - July 10, 2018 - PRLog -- The Town Dock is excited to announce the latest addition to their fully cleaned line of frozen calamari, Sunset Catch Calamari. Sunset Catch becomes the company's industry-leading third cleaned U.S.A. calamari line at a time when domestic demand for locally sourced seafood is at an all-time high. "Consumers are much more mindful of where and how their seafood is sourced, and that has a direct impact on restaurant operator demand," said Ryan Clark, CEO of The Town Dock. "We are giving our customers a new domestic option from a species that is plentiful and tastes great." Sunset Catch Calamari contains the species, Doryteuthis (loligo) opalescens, also known as California squid or market squid. It is a wild-caught species sustainably managed and responsibly harvested under U.S.A. regulations. "There is an underserved market for fully cleaned California squid, and Sunset Catch fills that gap while providing operators across the country a unique U.S.A. calamari product," said Patrick Maness, The Town Dock's Director of Marketing. The name, Sunset Catch, was inspired by the way squid is harvested off the coast of California. Fishermen head out at dusk and use bright spotlights to attract squid to the surface where a purse seine is drawn around the squid and pulled to the vessel. This contrasts with the early morning trawling method common on the East Coast. "The Northeast Doryteuthis (loligo) pealeii, or Rhode Island squid, is considered by many to be the gold standard for calamari, and consumers on the West Coast believe their market squid is even better," added Maness. "Sunset Catch opens the debate to the rest of the country." Sunset Catch Calamari is available now through foodservice distribution channels in tubes & tentacles, tubes only, rings & tentacles and rings only; each packed 4/2.5 LB. Located on the water in Point Judith, Rhode Island, The Town Dock is a vertically integrated seafood company specializing in supplying its customers with the world's finest calamari. With a waterfront location, exceptional global partnerships, and a dedicated fleet of fishing vessels, The Town Dock is the largest purchaser of US domestic East Coast squid. 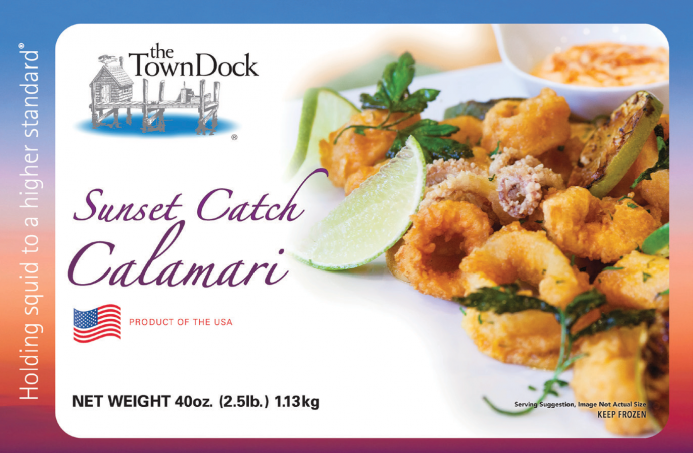 From food service distributors to national restaurant and retail chains, Town Dock calamari is found across the country and the world.